With all four songs on the Danger! 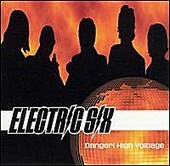 High Voltage EP originally released as singles for the band's other incarnation, The Wildbunch, the Detroit quintet Electric Six has re-recorded the songs under their new moniker, keeping the catchy, guilty-pleasure disco-punk-soul-rock-pop sound, tightening it up, and adding even more cheeky humor to it. Including The White Stripes' Jack White providing backing vocals on the title track, Danger! High Voltage is a comedic approach to an already comedic fusion of punk, disco, soul, and pop. Silly as all get out, Electric Six's sound is nothing more than something to make you forget about your worries, forget about it all, and have some fun. Tracks like "I Lost Control (of my Rock & Roll)", "Remote Control (Me)", and two mixes of "Danger! High Voltage" (Soulchild Radio Mix and the Thin White Duke Remix by Jacques Lu Cont), the latter of which trades the disco-punk for electronica, are all quick pick me ups. They'll instantly make you laugh with their silliness, but more importantly, they're catchy enough to make you want to sing along for hours on end. Rarely is a four song EP this silly, this fun, and this good. I'll give it a B.